This week’s burst of August heat calls for a bowlful of cool Cucumber Gazpacho topped with a salad garnish of Northern shrimp, basil and lime. Serving as a base, the gazpacho easily adapts to what’s freshest or on hand — everything is tossed into a blender or processor, and you can taste and adjust as you go. The garlic gives a nice warming note, though keep it in check as it can quickly overwhelm the balance of bright flavors. Otherwise, let whim be your guide. Amounts are for 4 first-course servings; we upped the amount of shrimp for a heartier dinner portion. – For gazpacho: Place the vegetables, herbs and yogurt in a blender or food processor, and puree until desired texture. Season with good olive oil, a dash of something acidic like vinegar or lime, and salt and pepper. Chill in the refrigerator for 1 to 4 hours before serving. – For shrimp garnish: Toss ingredients together in a small bowl, and season to taste. If making ahead of time, hold the lime (to keep the shrimp from turning mushy) and add when ready to serve. 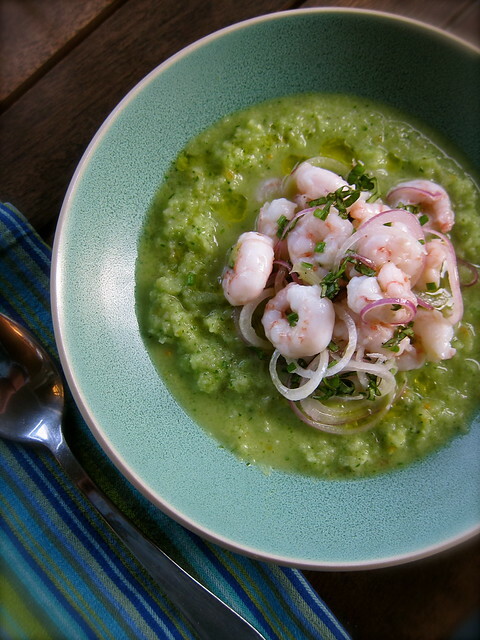 – To serve: Ladle gazpacho into bowls, and serve with the shrimp garnish spooned on top. Local ingredients: Green pepper and jalapeño from Meadow’s Mirth; yellow tomato from New Roots Farm; red onion from Misty Brook Farm; Northern shrimp from F/V Rimrack; yogurt homemade from Harris Farm milk; cucumbers, herbs and garlic from the garden. This entry was posted in cooking, garden and tagged cucumbers, herbs, peppers, seafood, tomatoes. Bookmark the permalink. Looks absolutely delicious and your photo is beautiful! This looks like a good way to use up some of the glut of cucumbers sitting in the fridge at the moment. This combination definitely had a lot to do with what needed to be used up! Looks beautiful and delicious! Im absolutely trying this one. I am so jealous of your Northern shrimp. Lovely and delicious soup, great hot summer days treat. I have all of these things between my CSA & my garden, hooray, hooray! I’m going to make this tonight – I’ve struggled to find a good recipe that has any oomph to it. Nice one, if you wanna see the original version….